YES! (for some reason) I couldn't get this picture anywhere!! YAY! Now I finaly got it!!!! Really nice!!!! this is a really nice scan. The colors are what get me. The moon in the sky is beautiful and chii fits in with it all perfectly. Nice Scan! This colors and so are great!! Make more such tinhgs oke? Her hair looks so great . I wonder what kind of pen Clamp use to draw it . Although this picture is not the greatest in sery CHobit but can't deny that it 's beautiful . ohh what a nice picture! its soo cute! keep up the great work!! Gasp! Oh yay! Finally a good quality scan of this! Chii is like a super model! I really love this scan. The sofa makes such good composition. And the colors and pose pwn. So elegant. Chii is very cute! Thanks for sharing! 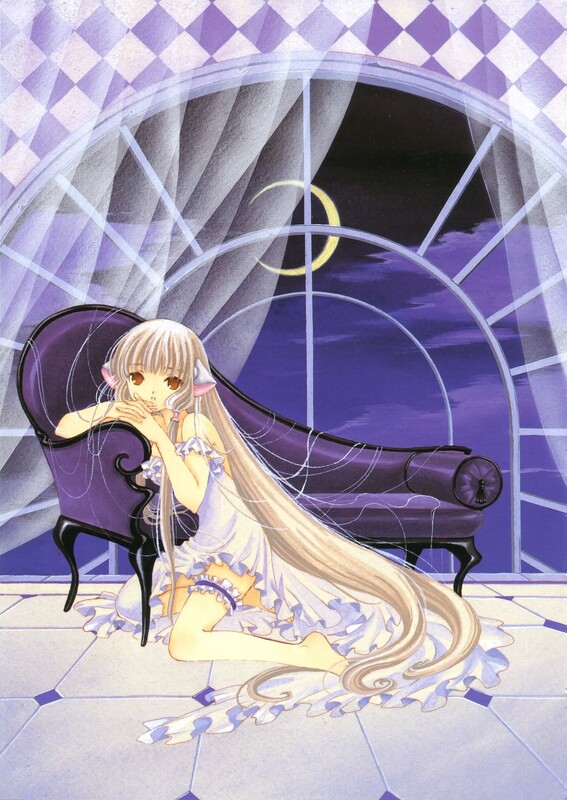 nice love it kawaii so cute..
thanks for the scan..chobits hav awesome dresses arent they?